In the waterline finishing and combined operations it is possible to define the priority direction of work passes joining in the resulting toolpath. 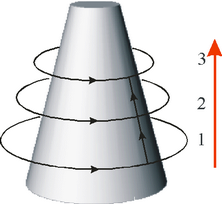 The direction of machining either can be downwards or upwards. 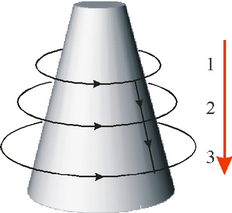 For models, which have surface areas close to the vertical, machining downwards is recommended. Machining upwards is advised for use on models with form-creating surfaces which are closer to horizontal. Machining direction can be assigned in the <Strategy> page.